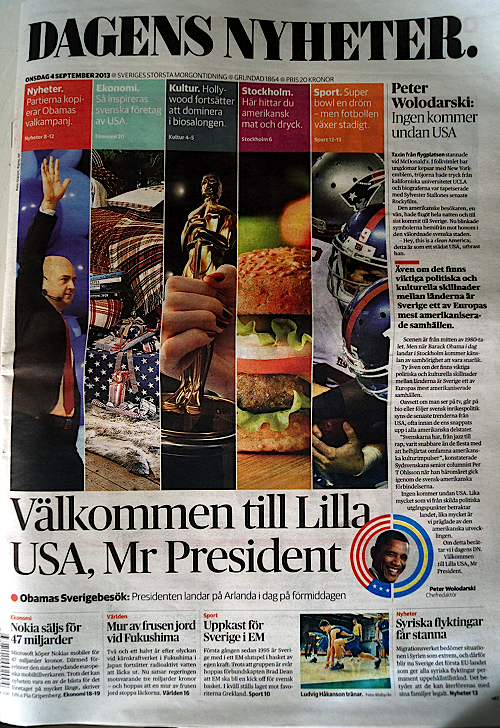 This is an analysis of events around the recent visit of President Obama to Sweden, 4-5 September 2013. A particular focus is devoted to commenting inconsequent geopolitical statements done by both President Obama and the Swedish rulers during his visit. The series comprises four chapters (see summary below): I) Introduction – "Welcome to Little U.S., Mr. President". Reviewing the parody. II) Assange, Snowden and the whistleblowing events as main factor in Obama's decision to visit Sweden. III) Chemical warfare and double standards. 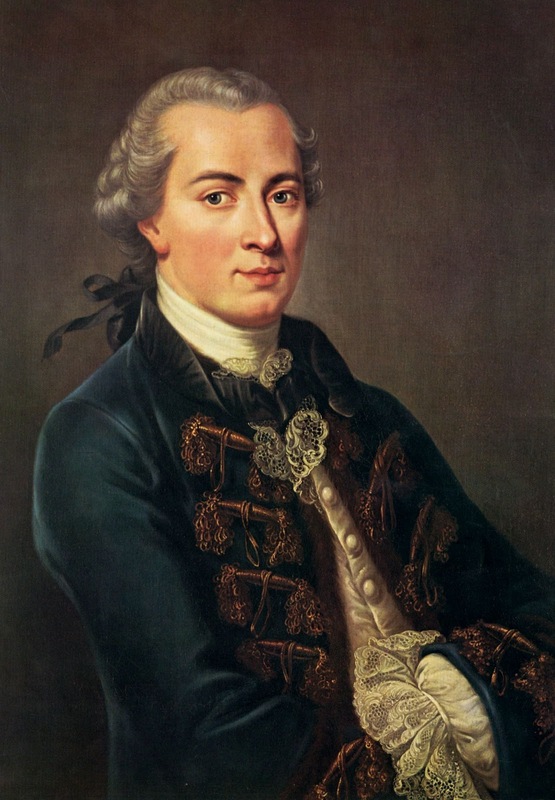 Barack Obama VS. Emmanuel Kant. IV) Swedish rulers’ joint homage of Raoul Wallenberg contradicts their current stances on ethnic issues in Sweden's contemporary society, as well Sweden’s secret Nazi collaboration during WW II. I. Introduction: Viewed in a historical perspective, the Swedish elites' reception of Obama was also an outstanding tribute to hypocrisy. 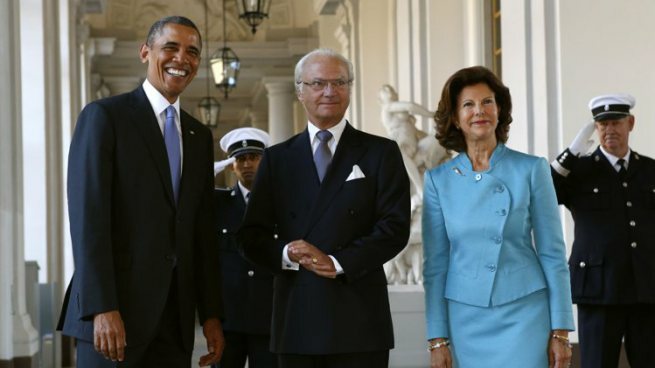 The "second-generation immigrant" Barack Obama was greeted by a set of right-wing rulers which have praised the achievements and fate of "ethnic Swedes" in comparison with "immigrants", amidst the highly discriminating labour-market of Sweden – and where the "second-generation immigrant" stigma is paramount. The suicide rate of foreign-born immigrants in Sweden increased 10,3 per cent in 2012 and was well over three times that of native Swedes. Equally astonishingly was the misconception of the US President about efficacy and equality in the administration of the nowadays-decrepit Swedish welfare. Sweden is reported being the EU country in which socioeconomic differences increased most in later years. The one and only myth about Sweden that Obama did not recall during his visit was "Neutrality". Chapter II: In spite of unequivocal declarations done by the White House – prior and after the asylum of Edward Snowden in Russia was known –, the Swedish rulers and MSM have given deceitful information about the reasons of Obama’s trip-rescheduling of 4-5 September (Stockholm instead of Moscow, on Obama´s way to the G20 Summit in Saint Petersburg). Professorsblogg examined a variety of speeches & remarks, press briefings, statements & releases, press conferences, etc., where the White House has treated the issues of Snowden, Assange, WikiLeaks and the Swedish option. In fact, the main factor explaining Obama’s reschedule-decision was the asylum given by Russia to Edward Snowden – the American whistleblower that could evade US capture thanks to the help of Julian Assange’s organization WikiLeaks. The chapter also assays possible rationale for this diversion by Carl BIldt's office, on the true reasons of Obama’s visit. Chapter III: I point out the ethical contradiction offered by President Obama in Stockholm. While praising international treaties prohibiting chemical war in order to legitimize his aggression plans in Syria, Obama has failed in explaining the multiple using of chemical weaponry by US military or its allies, particularly against Muslim populations. Professors blogg provide a list of such episodes - known in public record - with involvement of U.S. military. Chapter IV: This human-rights analysis touch upon the so far unsolved historical contradiction of the Swedish rulers, proclaiming today - together with President Obama - shelter for the Jewish, paying symbolic tribute to Raoul Wallenberg in a Stockholm synagogue, while never apologized for the selling and transporting of raw materials to Hitler, to be used – among other weaponry and machinery – for the holocaust of Jews. Did Sweden indirectly contributed to the Nazi "weapons of Jews destruction"? New research published 2013 provides further light about who really was Raoul Wallenberg, earlier accused of also being German spy. Leading Swedish newspaper DN: "Welcome to Little U.S., Mr. President"
Julian Assange described once Sweden (this is not a quote, but his meaning to the best of my recall) as an small society, which, by means of speaking an incomprehensible language that no one else in the world understand, have managed to remain exempted of outer control and real insight on its institutions. At this point I cannot tell what of the above is strictly Assange's or if I may have added some. The meaning remains the same. What really, or accurate, the "outer world" knows about this small country is hard to evaluate. I guess is not much. UK journalists still would write that Assange has no reason to fear extradition from Sweden to U.S. because "everybody knows" that Sweden is a "neutral" country and "it has been so since WW-II" (For instance, Clarie Harvey article on the case Assange in the Daily Telegraph bases such assumption in that Sweden is a “proudly independent nation that remained neutral even during World War II”). When I was Research Fellow at Harvard (Boston, U.S.) and I said I was from the Karolinska Institute (KI), very few among my very many fellow "officers" (so were categorized the academics in general to distinguish from "staff"), and which I met in different faculties, could identify KI as a Swedish Medical University. Worst, when I was a lecturer for postdocs at Harvard Medical School (Social Medicine) , most of the non-American postdocs believed that Sweden was Switzerland, and no one new that the Nobel Prize in Medicine was given by KI in Stockholm. No matter how well informed a President of a big nation as the U.S. may be about this small country, it was obvious in the speeches I listened at, that Obama has an idyllic, mythic notion of the Swedish social or socioeconomic panorama. And this includes his praise for the Heath-Care system availability. It was as he was referring to Olof Palme's Sweden of the 70's. 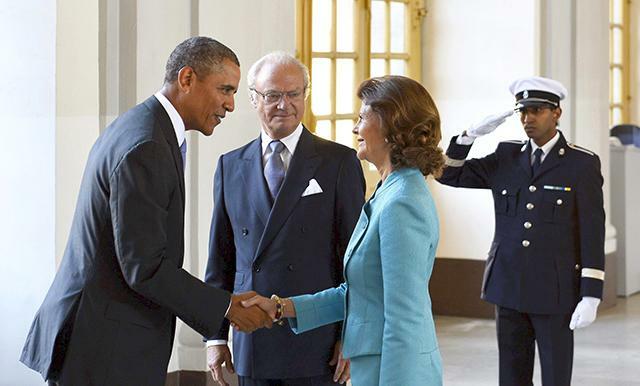 In fact, in contemporary Sweden "second-generation immigrant" Barack Obama is greeted by a set of right-wing rulers which have praised the achievements and fate of "ethnic Swedes" in comparison with "immigrants", amidst the highly discriminating labour-market of Sweden – and where the "second-generation immigrant" stigma is paramount. The suicide rate of foreign-born immigrants in Sweden increased 10,3 per cent in 2012 and was well over three times that of native Swedes. Equally astonishingly was the misconception of the US President about efficacy and equality in the administration of the nowadays-decrepit Swedish welfare. Sweden is reported the EU country in which socioeconomic differences increased most in later years. The one and only myth about Sweden that Obama did not recall during his visit was "Neutrality". When Obama praised, word after word, speech after speech, what he imagined was the avant-garde role of Sweden in integrating social equality in a free economy model, he most certain ignores that for instance young immigrants in Sweden have 70 % higher unemployment. And the smiling political elites that surrounded the U.S. President certainly did not told him that only 1,6 percent of all the complains received by the Authority "Diskriminerings Ombudsman", DO (government appointed) on the base of ethnic discrimination at working places, are further processed by the DO authority. In other words (literally translated): The authority avoids systematically to investigate ethnic discrimination. The welcome text of Sweden's leading newspaper DN is a self-portrait on how the Swedish establishment (politically, culturally and militarily wise) view themselves, and wishes to be regarded upon: Sweden as an appendix of U.S. and its interests. For the U.S. instead, Sweden is only a friend, or close friend, or partner (as discretely described in the White House "Statement by the Press Secretary on the President’s Travel to Sweden" of 7 Aug 2013). In Sweden's DN, the concept of Sweden as an independent, sovereign state is wiped out from the readers' understanding. Expressions as the above are in my opinion under the dignity of the average Swedish citizen. And I would believe that the Americans do not feel so comfortable with that over-adulation. Partly because one wishes friends to have our same sense of dignity and self-respect, and partly because such public declarations of cultural subjugation from satellites countries would contribute cementing a new emerging notion that America rejects: U.S. as cultural imperialism. For cultural imperialism would be only one step of the fascist ideology of cultural dominance über-alles, sustained by economic exploitation of other peoples' natural resources. And forced by militarily threat or intervention. Believe me that have nothing personal against Obama, and - as left libertarian - I do praise the civil values the U.S. proclaims to defend, and as long the political behaviours called to representing those principles would truly follow a) Jefferson's Constitution, b) the UN Chart on Human Rights, and c) at least the principal of Emmanuel Kant’s categorical imperatives. For I sincerely hope the US government shall desist from doing against other governments, those things they would condemn if done against themselves. I had to explain shortly afterwards to sceptic followers of @professorsblogg that I was only reporting from Sweden on what Obama did actually say, beyond my critical commenting on his stance in view of the engagements in chemical attacks which the U.S. military have incurred in the past (matter analysed in Part III, "Chemical warfare double standards. Barack Obama VS. Emmanuel Kant"). 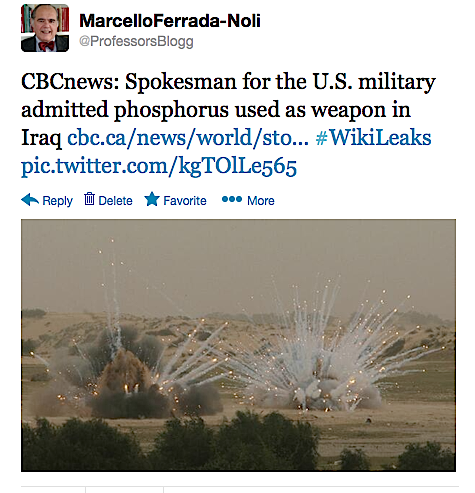 Is not that am affirming that Obama would have done the same than Bush when US military engaged in the use of phosphorus attacks in Iraq, or that Fredrik Reinfeldt would have done the same than the Sweden's coalition government that authorized the selling of weaponry-vital minerals to Hitler. 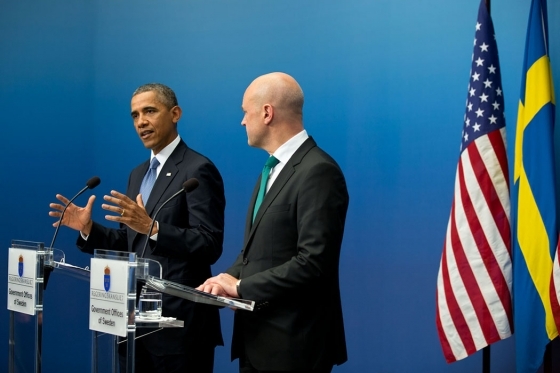 What I am saying is that the honest and educated Swedish people that saw and heard Obama condemning the use of chemical warfare, and saw Obama AND Reinfeldt visiting the Stockholm Grand Synagogue to honour the anti-Nazi deeds of Wallenberg, would have expect at least a retraction of Obama, respective Reinfeldt, on the deeds perpetrated by their political ancestors in the same office about the same crimes. Believe me that I was elated with the view of "second-generation immigrant" Barack Obama, standing proudly as US President, in the not seldom cultural-racist screen of Sweden's nationwide and State-owned TV. This is an outlet otherwise quite impermeable to the fate and misery of the Kingdom’s immigrant population (a group of lives comprising the 27 per cent of the census). But became perhaps the ultimate amidst the contrast showed in the visit of President Obama to Sweden, it was the view of a (Democratic Party) president of a republican country, paying a visit to the conservative, anti-republican, immigrant-phobic and insensitive “Swedish royal house” – kind of comically in the context – also exhibiting foreign-born roots; foreign-born queen not to mention. In these pictures of President Obama visiting the royal house it can be seen in the background a coloured young-man in uniform, doing salute. This “show” from the part of the Swedish royal house has never been witnessed (or pictured before – check out here by yourself). Is the exception which confirm the rule, a rule which in real life represents a staunch discrimination against Non-white, non-European immigrants. Chapter III: I point out the ethical contradiction offered by President Obama in Stockholm, while praising international treaties prohibiting chemical war in order to legitimize his aggression plans in Syria, have failed in explain the multiple using of chemical weaponry by US military or its allies, particularly against Muslim populations. Professors blogg provide a list of such episodes - known in public record - with involvement of U.S. military.